Rio Carnival is a wild 5-day celebration, 40 days before Easter. It officially starts on Friday and finishes on Fat Tuesday with the beginning of Lent on Ash Wednesday after which one is supposed to abstain from all bodily pleasures. Carnival with all its excesses, celebrated as a profane event, could be interpreted an act of farewell to the pleasures of the flesh. It is usually in February, the hottest month in the Southern Hemisphere, when summer in Rio is at its peak. There are carnival celebrations on virtually every corner of Brazil, the best-known ones taking place in Recife together with the neighboring Olinda (in the Northeast of Brazil) and Salvador. 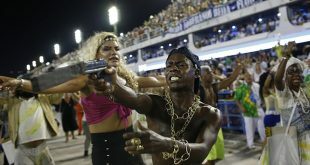 But the biggest and most famous carnival is undoubtedly Carnival in Rio de Janeiro. Each year, the Escolas de samba (Samba Schools) compete in the most amazing parade contest under strict rules. And each year artists, singers, actors, and famous people from around the world come to Brazil to be in the parade! What is “Escolas de Samba” (Samba Schools)? The Rio Samba Schools are associations or social clubs, representing a particular neighborhood of Rio de Janeiro in the annual Samba Parade. They are not samba teaching institutions as their name might suggest. The Rio samba schools are at the epicenter of the Carnival culture in Brazil and much of the “samba world” revolves around them. Their main objective is to prepare for and compete annually in the Samba Parade. In the final months of preparations before Carnival, they hold samba nights (called rehearsals – “ensaios”). These popular dance nights are open to anyone for a small entrance fee and provide entertainment just like night clubs do. The only difference is that you only hear samba music the whole night through, the school’s samba song of the year being plaid over and over again to practice the lyrics. The Rio samba schools are similar to huge football clubs, in many respect. They have a flag, a color-scheme and devoted (usually life-long) supporters. They clearly resemble modern corporate organizations, with several departments, sub-divisions, strategic partnerships and apply strong marketing technics. They have a fan group of enthusiastic supporters, official headquarters, workshops in Samba City and rehearsing samba halls, where followers meet, prepare for the next Carnival’s Samba Parade or just spend the night dancing away. The Samba Parade is a really glorious competition for which the scores are given by the judges. Just like sports, it offers entertainment while it has its rigid rules. The schools are judged in 10 categories. There are 4 judges of every category (altogether 40 of them). Every judge gives his scores on a scale of 5-10 (with fractions), 10 being the best. They are counted and announced on Ash Wednesday, just after Carnival. The judges’ booths are spread along the Samba Avenue (most of them in Sector 2, opposite Sector 7) and are clearly marked with a banner reading “Julgadores”. Can I be part of the parade? Sure thing! You just need to choose your Samba School and buy your costume. Get to know more about each Escola de Samba here and choose yours! I will see you in Rio! Brazil in Austrália / O Portal independente de notícias para quem quer morar e estudar na Austrália. E para quem já conhece mas quer descobrir mais sobre a comunidade brasileira na Australia. O POrtal Brasil in Australia é para você.Curta, Compartilhe e Participe!